I'm interrupting the 2nd birthday updates to bring to you this week's A Dollop Of My Home post. Ruth of Mommy Cafe sent me these shots of her living room. I took a double take when I saw the photos as her room layout is almost identical to mine! We share the same colour scheme, and I even have similar curtains (although mine's hung in the Master bedroom), window seat storage, and that same square woven placement! One stark constrast though, is that Ruth's place exudes such tranquility and orderliness. 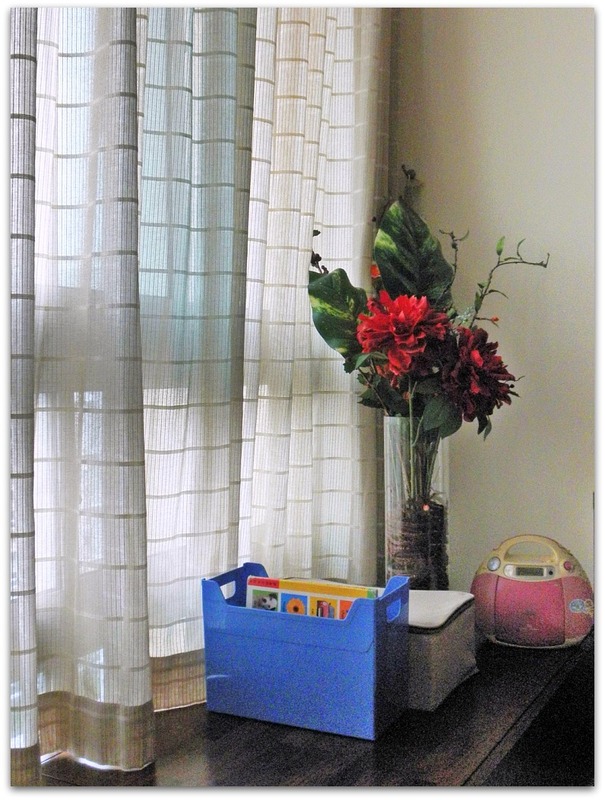 She did say that she recently did some decluttering, but still, with a toddler in the house, it is really kudos to her efforts that her home is this beautiful! I particularly noted the cushions on the sofa - I like the textures and patterns on them, creating interest paired with the solid coloured sofa. Ruth likes reading here, next to the full length windows. She enjoys the pretty diffused colours that come through the curtains, particularly in the late afternoons. When her boy naps, she sometimes like to cuddle up on the sofa to read, with a beverage on hand. Books and magazines will be stacked on the wooden storage boxes lined up against the windows. At the other end of the room, Ruth placed a tall vase and some artificial flowers with deep red hues that she loves. There's also a small CD player/radio that would be set to play jazz or instrumental music as she reads. The little nifty blue box holds some of her son's books. The handles make the box easily portable, and mother and son and choose to do reading time anywhere at home! We want to take sneak peeks of your home! 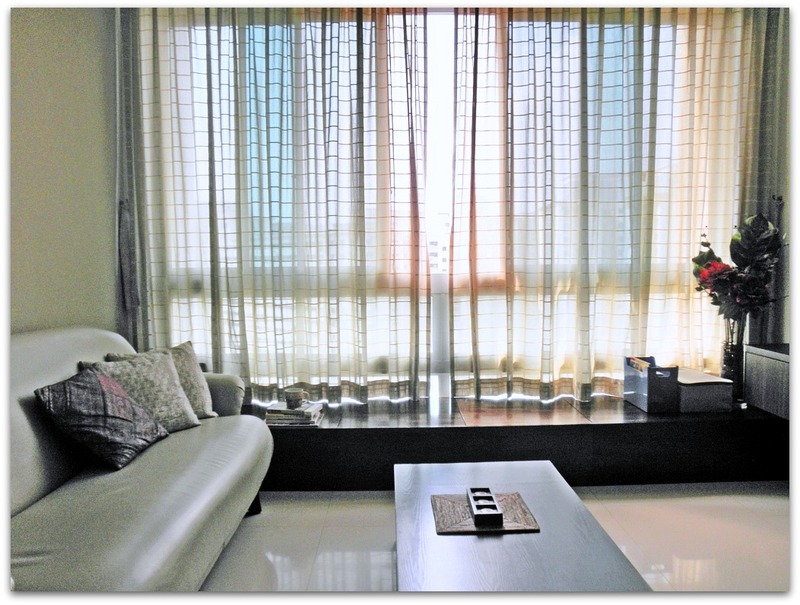 If you enjoyed viewing others' homes, do share yours as well! 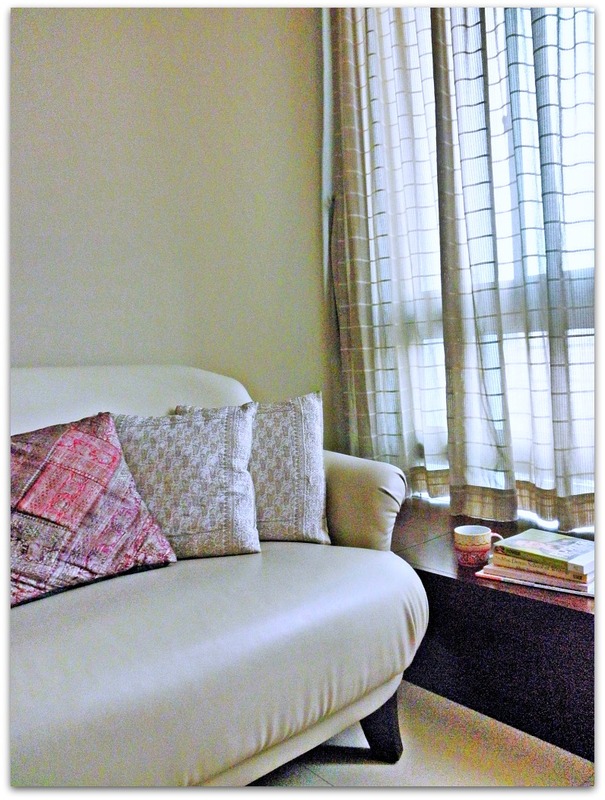 haa, i thought i see this (curtain) before too... yup, admire the quiet and minimalist of the space:). Hee, you have a good memory! :) And yes, I think it is a gift to be able to keep a space like that! Corsage: Thanks so much for featuring my humble abode!